THE STORY OF CHRISTIANITY VOLUME 1, is an informative, interesting, and consistently readable narrative history. It brings alive the people, dramatic events, and ideas that shaped the first fifteen centuries of Europe, such as the Spanish and Portuguese conquest of the New World. Historian Justo Gonzalez shows how various social, political, and economic movements affected Christianity's internal growth. Gonzalez skilfully weaves in relevant details from the lives of prominent figures from the apostles to John Wycliffe, tracing out core theological issues and developments as reflected in the lives and struggles of leading thinkers within the various traditions of the church. "The history of the church, while showing all the characteristics of human history, is much more than the history of an institution or movement," Gonzalez stresses. "It is a history of the deeds of the spirit in and through the men and women who have gone before in the faith." THE STORY OF CHRISTIANITY demonstrates at each point what new challenges and opportunities faced the church, and how Christians struggled with the various options open to them, thereby shaping the future direction of the church. THE STORY OF CHRISTIANITY will serve as a fascinating introduction to the panoramic history of Christianity for students and teachers of church history, for pastors, and for general readers. 488 pages, from Harper San Francisco. 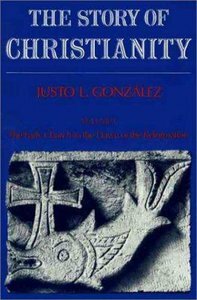 About "The Story of Christianity (Volume 1)"
Justo L. Gonzalez (Ph.D., Yale University) author of the highly praised three-volume History of Christian Thought and other major works, Dr. Gonzlez taught at Candler School of Theology of Emory University in Georgia for eight years followed by eight years at United Seminary. He is the author of numerousbooks, including Essential Theological Terms and The Apostles' Creed for Today. He is also the editor of The Westminster Dictionary of Theologians. Customer Reviews For "The Story of Christianity (Volume 1)"
I was assigned this text as a basic reader in a Bible College church history class but it soon became one of my favourite reads. It is written at a level that is accessible to most and yet enough detail to be used at an academic level. Gonzalez is enjoyable to read and brings the situation of the early church to life. A must read for anyone who wants to get a simple grasp on the history of our faith!